Summary: Diet cookbooks should be about dropping weight, not depriving yourself. By swapping this for that, you can turn your favorite foods into low-calorie creations--proving once and for all that you can have your chocolate molten cake, and eat it too! Flat-Belly Eggs Benedict (with turkey bacon or lean prosciutto instead of bacon or ham)--save 465 calories! Smoked Gouda Burger (with turkey bacon and a whole-wheat bun)--save 716 calories! Monterey Chicken Pasta (with sugar-free BBQ sauce and reduced fat cheese)--save 345 calories! Molten Chocolate Cake (with less cream and more strawberries)--save 262 calories! I don't think I ever get tired of looking through cookbooks (notice I didn't say cooking -- it's not the same thing at all!) 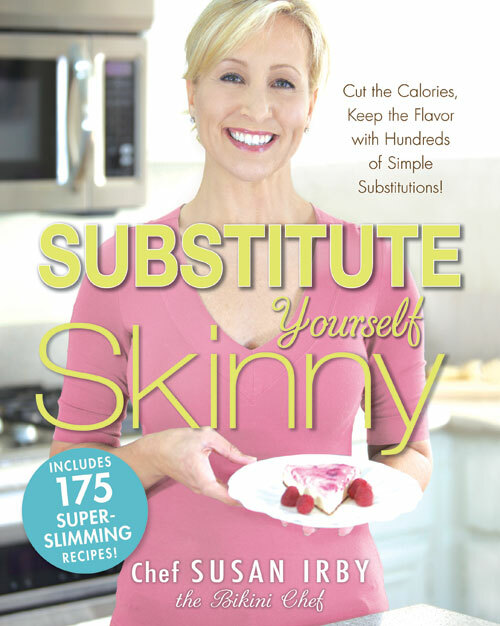 SUBSTITUTE YOURSELF SKINNY: CUT THE CALORIES, KEEP THE FLAVOR WITH HUNDREDS OF SIMPLE SUBSTITUTIONS! by Susan Irby is my most recent find! There are just so many recipes in this cookbook that look good to me. I have to confess that I didn't actually make anything out of this book yet, but I swear there are loads of recipes that I'm going to make. The past two weeks have been crazy around our house, and we haven't actually sat down for a dinner. Isn't that an awful thing to admit? Between dance, karate, soccer, book club, piano, spring concert, and school fair, we've had multiple activities every night. Hopefully in a few weeks, things will calm down and I'll go back to cooking. 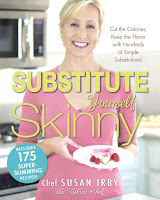 And when I do, the first cookbook I'll open is SUBSTITUTE YOURSELF SKINNY. So many recipes that I want to make from magazines and cookbooks are just chock full of fat and calories. I might drool over them, but truth be told, I like to cook relatively healthy. That's one of the things that I really liked about SUBSTITUTE YOURSELF SKINNY -- the recipes look delicious and they are healthy at the same time. The concept behind this cookbook is that you can make some simple substitutions in your everyday eating which help to cut fat and calories without sacrificing flavor. Definitely my idea of a useful cookbook! You should see my copy of SUBSTITUTE YOURSELF SKINNY. There are so many recipes that I've marked to try. In fact, there are over 175 recipes in this cookbook; and I swear most of them appeal to me. The cookbook is divided into the following sections: jumpstart-your-day breakfasts, energizing lunches, thinner dinners, slimming sides, guilt-free snacks and appetizers, and deliciously skinny desserts. I liked that there were over 30 main dish recipes because that's what I find I use in most cookbooks. Although I will admit that there were quite a few breakfast and lunch recipes that appealed to me too. Some of the recipes that look delicious include the mexicali low-cali breakfast burrito, the chicken chili, the summer savoring mac 'n' cheese, the buff 'n' low buffalo chicken chowder, the peppery chicken pasta, and the inch-away chicken enchilada. However, there are many more. I didn't even list all of the yummy sounding desserts. There are a lot of great things about this cookbook. I liked that there were color pictures of the recipes -- not all of them, but quite a few. In addition, I love the nutritional analysis included for each recipe. On the top of each page, there is a block which tells you how many calories you are saving with the author's substitutions; but there is also a breakdown of calories, fat, carbs, protein, and sodium. Another thing I really appreciated about this cookbook is that the recipes are all relatively simple. And they include normal ingredients which is huge for me. In fact, I actually have on-hand almost all of the ingredients for quite a few recipes. I also liked that most of the ingredients are fresh rather than pre-packaged. There were two slight issues that I did have with this cookbook. The first being that it would have been nice to include the fiber grams for each recipes I know this number is important for those of you who are doing Weight Watchers. In addition, I would have liked to see a suggested prep/cooking time for each recipe. Like many of you, I'm usually in a hurry to prepare dinner and it would have been helpful to quickly go through and see how long each recipe should take to make. Substitutions such as reduced-fat or nonfat feta cheese save on calories and fat; however, cutting back on the amount of extra-virgin olive oil in dressings is another key factor in keeping your recipes slimming. 1. In a large mixing bowl, toss together the lettuce, cucumber, tomatoes, onion, bell pepper, olives, and cheese. 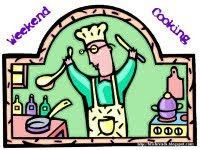 Separately, in small bowl, whisk together the oregano, oil, lemon juice, salt, and pepper. Pour over the lettuce mixture and toss well to coat. 2. Serve on salad plates as an entrée or side dish. This recipe has so many great flavors in it that you can skip on the heavy salad dressing, which can add up to over 500 calories to an otherwise light salad. Thanks to FSB Associates for sending me a copy of this cookbook! This sounds like a great idea for me, although I tend to be especially fond of things that would probably be substituted out! This is the second review of this book and I am intrigued. I usually try to figure out substitutions on my own, so it'd be nice to have someone do it for me. That salad does look good. I love salads and could eat one for my dinner every day! That recipe sounds delicious! Sometimes it's hard to know what you can substitute so this book sounds like a good idea. I love salads and I'm always eager to discover something new, or, a new twist on an old standby. Thanks for including the "It's Greek To Me" salad recipe -- I'll make that salad tomorrow. I love Susan Irby's books (I have three of them) including this one. Her food is so good you'd never guess it was healthy!